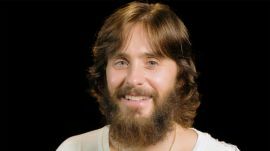 In this episode of Birthday Stories, Jared Leto talks about the birthday when he was hiking through the snow on a mountain with his dog. Leto's playful pooch eventually found a porcupine and ended up looking like a pin cushion as quills stuck out of its face. Jared took his dog to a nearby bar and had to pull the quills out with pliers. Interesting choice for "favorite birthday ever". 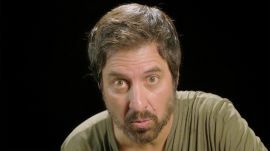 In this episode of Birthday Stories, Ray Romano talks about how his wife was able to successfully throw a second surprise birthday party for him. Even though Romano was on the lookout for a surprise, his wife managed to hide it under the guise of a charity request that included Dina and Clint Eastwood and Rod Stewart. Once Romano showed up to the charity event, he was welcomed by all of his friends and family from near and far. 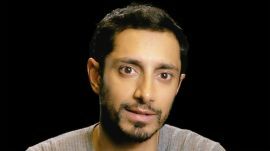 In this episode of Birthday Stories, Riz Ahmed (Rogue One, The OA, The Night Of) admits he had a lot of anxiety and stress heading into his 30th birthday. The Emmy-winning actor finally decided to let it all go and be himself. Born on December 1st, 1982 in Wembley, London, England, Ahmed celebrated turning 30 with his friends but was a little miffed he didn't get as many gifts as expected. 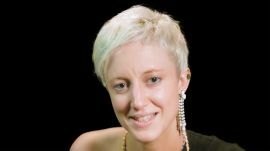 Andrea Riseborough (Black Mirror, Battle of the Sexes, Nocturnal Animals) tells the story of her favorite birthday ever. First, the actress confesses she forgot her birthday on two separate occasions. Then, she recounts how she sent out a mass text to all her friends for a birthday hangout and all of them came! 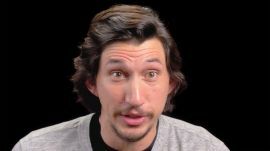 In this episode of the "Birthday Stories" series, actor Adam Driver (Star Wars, Girls, Paterson) talks about how his wife got him a dog for his birthday. Since Adam hated Halloween so much, his wife was forced to let the cat out of the bag early. 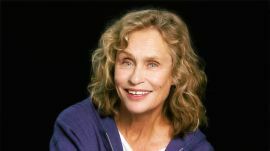 In this episode of Birthday Stories, actress and producer Lauren Hutton (Nip/Tuck, American Gigolo, Once Bitten) always has the best birthday whenever her age ends in a seven: 27, 37, 47. A couple years ago, Emma Stone got a surprise birthday party themed to the popular murder mystery board game and cult classic movie "Clue". The actress played the part of Miss Scarlet and her friends dressed up in costumes for a game of whodunnit. The night featured a fancy dinner with cards that contained clues and an intriguing search party. 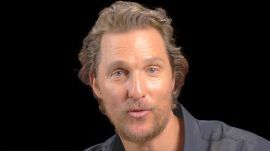 In this episode of Birthday Stories, Matthew McConaughey talks about the surprise birthday party his wife and kids threw for him at the river where he learned to swim. McConaughey recalls the family had the place all to themselves. The actor cooked all night and his son served as DJ. The next day, the McConaughey clan ventured to a swimming hole that had a rope swing and spent hours playing in the water. 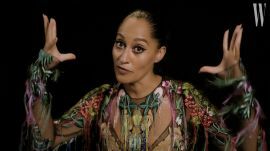 Tracee Ellis Ross' favorite birthday was certainly one to remember. A private jet, supermodels, fashion shows...quite an 18th birthday! Tracee shares the story of the incredible birthday where she was on a concord jet with her mom (the iconic Diana Ross), Naomi Campbell, Linda Evangelista, and Christy Turlington and walked in a Thierry Mugler fashion show. Katy Perry is, in her words, "such a birthday party girl". That day gives her an excuse to throw a massive party. The singer admits she gets so much joy from watching her friends have the most fun and make long-lasting memories. For her 32nd birthday, she hosted a Halloween-themed 1950s sock hop that made guests feel like they'd taken a time machine. 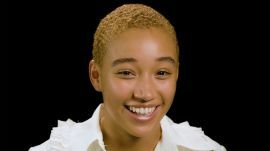 Amandla Stenberg (The Hunger Games, Rio 2, Sleepy Hollow) got her nose pierced without her mom's consent on her favorite birthday. 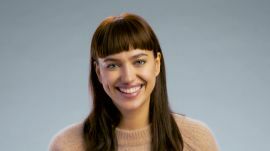 With the help of her older sister, Stenberg was able to feel like a real teen. 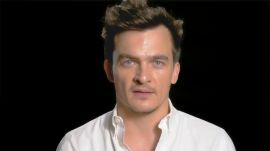 Rupert Friend's favorite birthday story was when he turned six. In 1987, a great storm hit the farm where he and his parents lived. All the trees blew down and young Rupert asked when the trees would be up again. On that day, he found out that time is real. Naomi Watts tells us about her favorite birthday. On that day, she was "fully pregnant" and "stone cold sober", but received a fantastic gift from her husband Liev Schreiber: a mashup of Naomi's movie scenes spliced together with friends and family. Sanaa Lathan ("Love & Basketball", "Out of Time", "Shots Fired") recounts her favorite birthday story to W Magazine. When "The Best Man Holiday" actress was a girl, her dad, Stan Lathan, was one of the first black directors in TV. While helming Sesame Street, he blindfolded Sanaa and brought her on set to meet Big Bird then was treated to a rendition of the Happy Birthday song by the entire cast and crew. Michelle Williams had a perfect birthday when her neighbor and her neighbor's two daughters cooked a beautiful meal with Michelle's daughter. The top highlight came when one of the kids spilled soup on the floor so the dogs could have some. As Williams put it, the experience was messy and real, just like life. Taraji P. Henson describes herself as a 'nosey Virgo' who's not easily surprised. 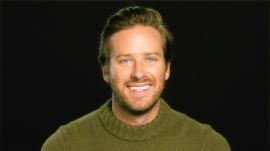 That's why the 'Empire' actress was so impressed by her 16th birthday party, which took place in her dad's basement in Washington, D.C.
Armie Hammer's favorite birthday activity is cooking for a small group dinner of 10-12 people at his house. When it comes to cooking, Hammer loves to barbecue outside. Chris Pine admits he usually had his birthday at Medieval Times or the Renaissance Faire as a young squire. 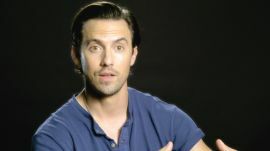 The "Wonder Woman" actor also loved getting "killer" books as birthday gifts. Alexander Skarsgard went to his hometown in Sweden on his favorite birthday. There, he got french crepes with childhood friends and family then hung out at a local pub. 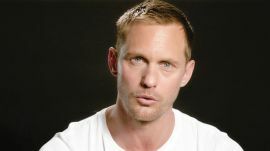 It was the first time Skarsgard was able to be in his hometown on his birthday in years. 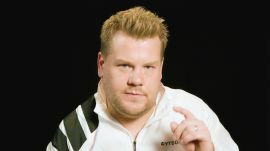 James Corden's favorite birthday was at the critically acclaimed Italian restaurant Osteria Mozza on Melrose Avenue in Los Angeles. Corden's friend Lucien asked the talk show host if he ever imagined having dinner with so many friends when the British comedian first moved to L.A. two years ago. The question caused James to really appreciate how far he's come. 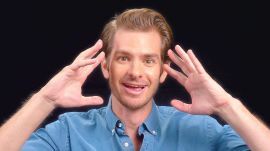 Andrew Garfield ate some special brownies with friends at Disneyland and rode Space Mountain three times in a row then freaked out on the It's a Small World ride. Garfield and his cronies broke out an impromptu, choreographed dance to the music playing at Fantasyland. The actor admits he was so overcome by the amusement park that he almost bought a Chewbacca back-pack. 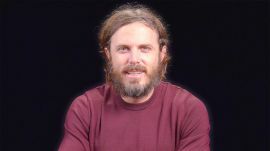 Casey Affleck's birthday is only three days separated from his brother Ben Affleck's, so they typically have a joint birthday party. One year, their mom hired a belly dancer who performed in their backyard for friends and parents. Chris Hemsworth's favorite birthday was when he turned 15. On that day, the actor who plays Thor received a brand new surfboard from his parents. Even after all the fame and fortune Hemsworth has earned, he still thinks back to that surfboard he couldn't bring himself to wax. Brit Marling's favorite birthday was when she turned 4 and dressed up as She-Ra Princess of Power aka The Most Powerful Woman in the Universe. Don't worry, the normally revealing She-Ra costume was designed to be more kid-appropriate. Her friends at the party could only dress up as ancillary characters, but not one He-Man showed up. Now, Marling's thinking of throwing another She-Ra birthday party just so some He-Man characters attend. 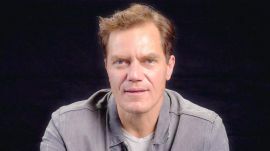 Michael Shannon's favorite birthday was a total surprise. For his 30th birthday, Shannon's friends threw him a surprise party at Weeds bar in Chicago. Contrary to popular belief, Shannon liked the surprise, mostly because it was a great turnout. Shannon admits it wasn't difficult to get him to go to the bar and confesses that he didn't scream, but he did lose control of one bodily function. 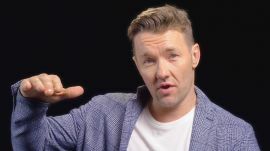 Joel Edgerton's least favorite birthday was when he turned five years old. On that special day, the actor dressed up like The Incredible Hulk and tried to "Hulk out" by jumping off a wall, but ended up winded and crying. Nicole Kidman's favorite birthday was when the actress turned 40 years old. While Kidman was shooting her film "Australia", her husband, Keith Urban, put together a huge fireworks display just for her. Annette Bening's favorite birthday was when she turned 16 years old. She didn't receive the typical, full-blown sweet sixteen that some young women revel in. Instead, there wasn't much fanfare other than her mother's gift: a clock! Ironic that as time has passed, the lesson learned has been immeasurable. 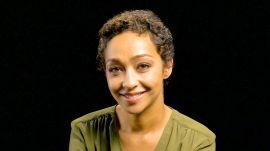 Actress Ruth Negga (Preacher, Loving, Agents of S.H.I.E.L.D.) confesses that she's funny about her birthday and is somewhat embarrassed by it. Turns out Negga always finds herself working on her birthday. However, when it comes to her childhood birthdays, all she cared about was cake and sweets. 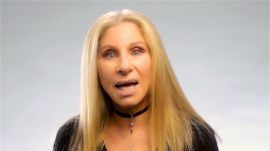 Singer-actress Barbra Streisand’s favorite birthday was when her son, Jason Gould, surprised her with a mammoth multimedia presentation. Gould presented an amazing film he’d made for his mother that featured pictures of them from when he was a baby. Jason also sang a song and played a record that was so beautiful she literally fell off her chair! From that point on, she and her son traveled together on tour to sing almost every night. Model Gigi Hadid’s favorite birthday was when she turned 13. The Victoria's Secret and Sports Illustrated swimsuit model went to a Los Angeles Lakers game with her parents and friends where she got to see her favorite player Kobe Bryant. Hadid wore a yellow and purple wig, her Kobe Bryant jersey, and even had a Kobe Bryant cake. 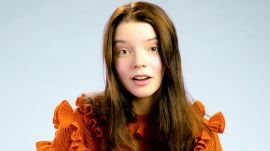 In this episode of Birthday Stories, actress Anya Taylor-Joy (from "Split", "Morgan", and "The Witch") talks about her favorite birthday. She says her parents took her to see the 2016 Broadway revival of Arthur Miller's The Crucible. That's when she was absolutely starstruck by "Brooklyn" actress Saoirse Ronan. Taylor-Joy admits she had no chill and needed to take a breather after hanging out with Saoirse. The two starlets hit it off over witches! 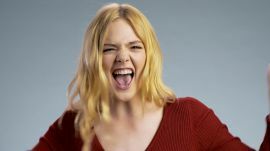 Elle Fanning’s most memorable birthday party took place at the "essential spot" Chuck E. Cheese’s. Fanning, ever the bold one, got up to dance with the mascot himself while the rest of her friends' parents looked on in awe — and she has video footage to prove it. 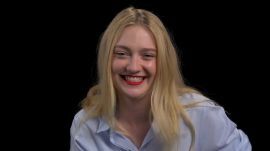 When you ask Dakota Fanning to name her favorite birthday, she gets stuck between her 10th and her 21st. For her 10th birthday, Robert De Niro and the rest of the cast of "Hide and Seek" threw her a surprise party, featuring "Bob" in a party hat, while her 21st? "Wild." Cindy Crawford likes other people's birthdays more than her own. Ideally she would spend hers doing something low key, like eating a baked potato with caviar with her kids, something she doesn't eat during the rest of the year. 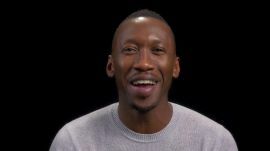 Mahershala Ali got stranded in Reno due to a blizzard on the way to a family retreat in Lake Tahoe for a surprise birthday party. While stuck for two days, they made the best of it by playing video games at the Circus Circus casino. 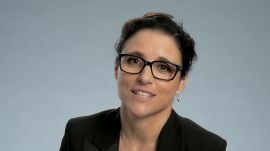 In fourth grade, 'Veep' star Julia Louis-Dreyfus received a suede vest — complete with fringe — for her birthday. Then, naturally, she wore it bowling. See the actress recount her best birthday memory (and its memorable fashion moment) on the occasion of her 56th birthday. Irina Shayk and five of her girlfriends went to Maldives for her birthday and snuck out to take a night time swim in the Indian Ocean against the advice of the hotel staff. Don't worry, though, they wore shoes.